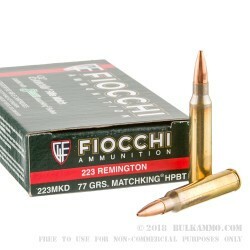 This Fiocchi .223 Remington ammunition represents the extreme end of accuracy for the round in a mainstream load type. Aside from the ultra-premium tier of rifle ammunition, this round offers some of the best accuracy and component quality available. This is also available at an extreme discount to ultra-premium cartridges. 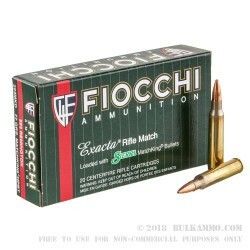 Fiocchi produces an incredibly good round, albeit a bit pigeonholed into a category that requires certain rifle specifications and use cases to be most efficient. The 77 grain projectile in this cartridge is literally the most celebrated bullet design in match history: the Sierra Match King. This Hollow point boat tail match grade projectile is the number one in volume of competition awards received. It has accuracy that is inherent to the design, but it has also been proven heavily over the years. The 77 grain projectile means this cartridge is best suited to short twist rates for the .223 Remington, for instance: the 1 in 7 rate. Yes it is a pricy round, but it still offers a significant price benefit over other rounds loaded to the same quality specification. High quality annealed neck brass and a Boxer primer makes this a good round to reload too. The powder, owned/produced by Fiocchi is clean burning and is loaded to a specification that produces an extremely tight velocity range, allowing for far better accuracy. 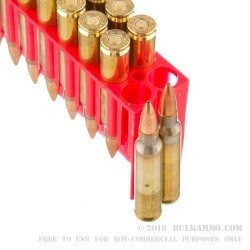 Q: Will these cartridges fit in AR-15 magazines? I just wondered because of the longer bullet length. Thanks! A: Yes, these 77gr SMK BTHP projectiles are loaded to what is called "magazine length," and can be safely loaded into and fired from AR-15 magazines. Q: Would this round be a good choice for an AR with a 20" SS Barrel that has a 1-9 Twist? Would it only be good for long shots or good for both medium and long shots? A: It is not recommended to fire 77gr .223 ammunition through a 1/9 twist barrel, for the twist rate is not sufficient to stabilize the projectile. While this may vary from barrel to barrel at short range, it would certainly be noticeable with all 1/9 twist barrel at long range. 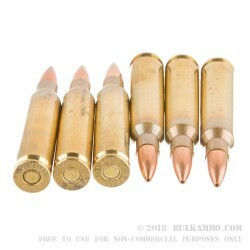 You might find that your 1/9 twist barrel will perform well with 75gr ammunition, but it will certainly stabilize 69gr BTHP as loaded by a number of manufacturers. All three projectile weights are capable of high accuracy at range, but wind drift is greater with the lighter projectiles, which have lower ballistic coefficients.